Google secure search provides you with the ability to search with an encrypted HTTPS version of the Google search. This means your connection to Google is secure and no one between you and the Google servers can intercept your search query. Google secure search also turns off the browser referrer, so if you search for something like "Add Google Secure Search to Firefox" and you end up at JakeLudington.com, my Web analytics software has no way to know that your visit to the site was a result of that search query. It also prevents your ISP, the owner of the WiFi hotspot where you surf, and anyone else from knowing the search query you typed. The security ends at the point where you click on the Google result and go to the website. There are currently two ways to use the encrypted Google search in Firefox. You can simply go to the Google Secure Search page on Google.com. If you make this a bookmark in Firefox, it will be quick and easy to get there. If you're like me, you don't do much searching from Google.com, you use the search box built into the browser. Firefox doesn't let you change the search provider to Google Secure Search very easily, but there's a Firefox add-on from Google that will make the switch for you. Simply install the Google SSL add-on in your Firefox browser and you will be searching securely as long as the add-on remains installed and active. 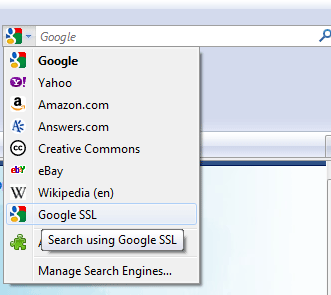 Set the Google SSL Search as your default search provider in your browser to make it the permanent search solution for Firefox.